I have used the recipe in the Tartine book, the ever famous pastry shop in San Francisco, that I have modified only slightly. If you do not know the book, I highly recommend it. All the recipes I have tried have turned out to be a success. Making choux dough may seem a bit scary at first, when you've never even attempted it, but I assure you it really is not difficult and the result is well worth it. And with my Thermomix it is a breeze. Lately I have been preparing these puffs quite often whenever we have had guests and they are always a hit. Preheat the oven to 170ºC if convection type, some 10ºC more if only radiation type. To make the choux dough, put the milk, butter and salt in a saucepan and bring to a boil (heat to 90°C in the Thermomix, about 5 minutes on low speed). Once the mixture is hot, tip the flour in all at once and, without removing the pan from the heat, stir vigorously with a wooden spoon until the dough coheres into a ball and starts to detach from the walls of the pan, about a minute (Thermomix 20 seconds, speed 4). Turn off the heat, allow the dough to temper about five minutes and then add the eggs one at a time, stirring well to absorb each time before adding the next egg (in Thermomix speed 4, no time). You will have a soft, sticky dough. Add the cheese and mix with a spatula. Beat the aditional egg and gently brush the dough mounds. Sprinkle with more cheese or herbs, if desired. The last time I made them I did not brush them with egg, but just sprinkled with a herbed salt mixture from La Camargue... delicious. Bake for 25 minutes, be careful not to let them get burnt. When done, transfer to a wire rack to cool. If there is still dough left, keep baking for as many batches as necessary and remember that the parchment paper can be reused. (*) Tips: If the dough is too runny, so much so that it pours out of the pastry bag when you lift it vertically, just let it cool a bit, until the consistency is thick enough to make the mounds. Getting the "feel" of this dough just takes a little practice. On the contrary, if the dough is somewhat thick, so that is a bit hard to pipe, there is nothing really to be done, but it does not mean the gougères will not rise (well, unless the dough has the consistency of cement). They will turn out equally succulent. I advise against the use of silicon sheets on baking trays for these puffs, at least in my case I think that once they prevented my puffs from rising up right. Using parchment paper they blow up divinely like little balloons. Oh I love these! 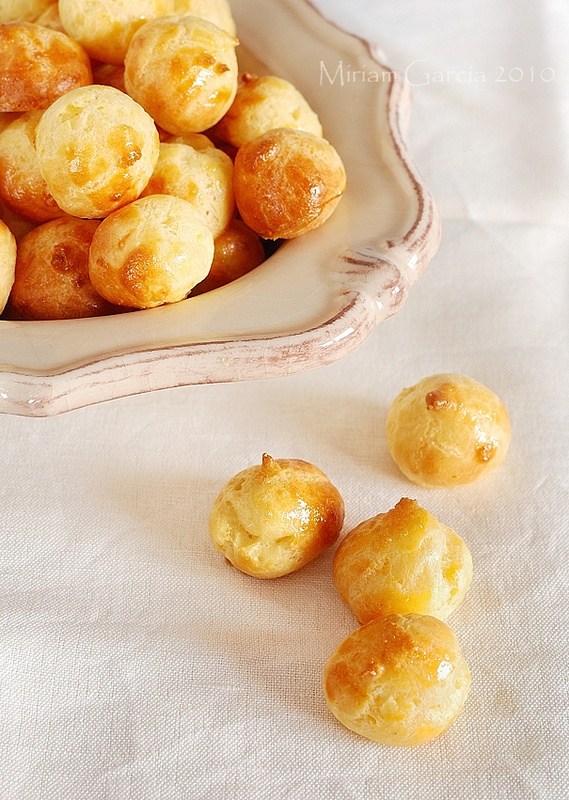 They're similar to pao de queso which I could wolf down a dozen easy. Delicious little cheesy morsels Miriam. These sound, and look, just delightful! So nice to bite into something fluffy and cheesy! Thanks for sharing. Miriam, I LOVE airy, cheesy gougères. Yours came out golden and perfectly puffed. They look delicious! These look so fun for a get together and delicious! Fluffy and cheesy... such a great combination. My guy would love these. Gougeres are one of my favourite things. Never thought to use manchego. They would be great. Manchego is one of my favorite cheeses. These sound delicious. This looks delightful! Adding this to my recipe box! I will try it with manchego, great idea with a glass of vino! Love your photos!!!! Oh I could eat one after the other without stopping! I love the idea of trying different types of cheese with different flavors in these treats and yours look perfect! I haven't made gougères for so long and now I think I will. Lovely! Miriam, que delicia! Felicidades por llegar al 'Top 9'. hola! que ricos se ven! espero poder prepararlos pronto. el roscon de reyes tambien se ve divino! te felicito por un blog tan bueno y las fotos estan fantasticas. saludos desde puerto rico! These sound great and I have an upcoming party I would love to try these for. Two questions - Do you recommend serving these room temperature? Also, would you happen to know the metric conversions for this? I don't like to guess since it's baking and would hate to throw off the recipe by incorrectly converting the measurements. I'll take a plate of those for myself and a large glass of cremant de bourgogne (or any other sparkling wine), if you please! I was reading MFK Fisher's "long ago in France" recently, about her years in Dijon, and she mentions repeatedly the delicious appetizers consumed in various ladies' parlors during afternoon (frequently boozy) tea parties. I'm sure these gougeres would have been among them. Lovely photos, como siempre! I'm new and am loving your blog photos are stunning and as I am a Manchego addict will be giving these a go. Congrats on Top 9! I love love love gougères and your take on them sounds fabulous! Great job! Just what I was looking for and quite thorough as well. Thanks for posting this, I saw a couple other similar posts but yours was the best so far. I hope it stays updated, take care. I recently discovered the deliciousness of Manchego and use it in pretty much anything and everything! Although I have not tried using them in gougeres yet, I'm sure that they were out of this world, especially paired with all kinds of charcuterie. Nicely done! I can't remember if they were called gougeres or not, but when I was at Ballymaloe Cookery School we made choux pastry balls like this that were mixed before frying with mashed potato. They were unbelievably good hot, straight from the fryer. I look forward to revisiting the experience with your manchego version! Please tell me at what point shall I put in the manchego? You're right Liliana, I just added the missing direction, thanks for pointing it out! Belinda, Val, CD, Nisrine, PC, AOFP, Pink: thanks! Sherlly, MoS, Jenny, Joumana, MB, Jamie, Adriana, Darcy: thanks! Cathleen: at room temperature they´re perfect. And on the right hand sidebar of my blog you can find an online unit converter. TGS: mmm, with potato... yum! Ohhh, these look wonderful! 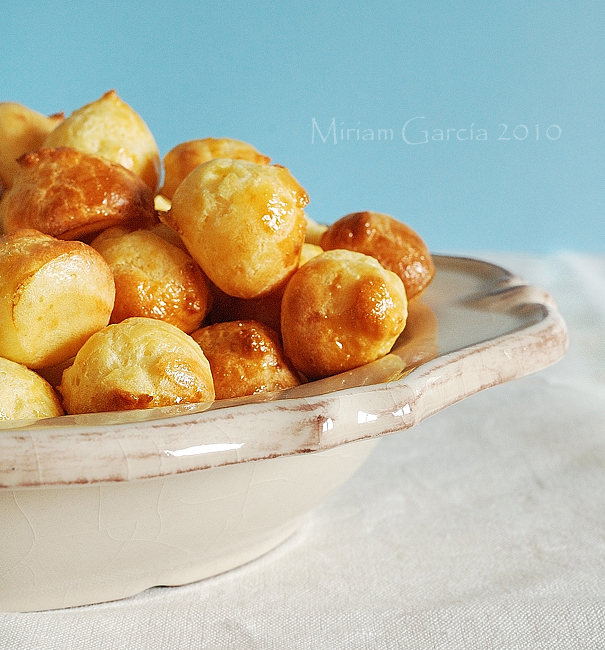 I love gougères--Brilliant that you used Manchego! Can't wait to try that!